Do You Have A Problem with False Claims at Your Car Dealership? Does this story sound familiar? Your service team completes a job at your dealership. The customer arrives to pick up the car and claims that your mechanics damaged the vehicle. Without evidence, it’s his word against yours and it opens the door to a potentially lengthy and costly process. However, there is a simple and effective solution. Video surveillance. There are many benefits to a customized video surveillance system like one from Stealth Monitoring. During specified monitoring hours, our team of trained security operators will watch cameras at your property in real time to deter unwanted activity. During non-monitoring hours, our cameras continue to record activity which can be used later to review an incident. So, in the case of a false claim, our video review team can examine the footage to determine if anything happened while that customer’s car was at your dealership. Look at the video to see our service lane cameras in action. As stated earlier, our customized surveillance system can also deter and help prevent criminal activity at the car dealership during monitoring hours, which typically occur at night after everyone has left the property. If our security operators see suspicious activity, they can activate a speaker warning and call local police. This is especially beneficial on larger lots which have more places for criminals to hide. Our surveillance cameras help us locate and track criminal movements throughout the property. 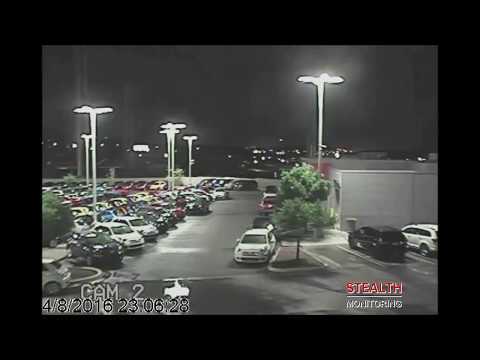 Watch the video below to see how we helped responding El Paso police officers locate car dealership thieves. In addition to deterring crime and monitoring service lanes, a customized car dealership security system can help track employee activity and ensure they are following protocol and safety procedures. Contact us to learn more about car dealership security and how it can benefit you.